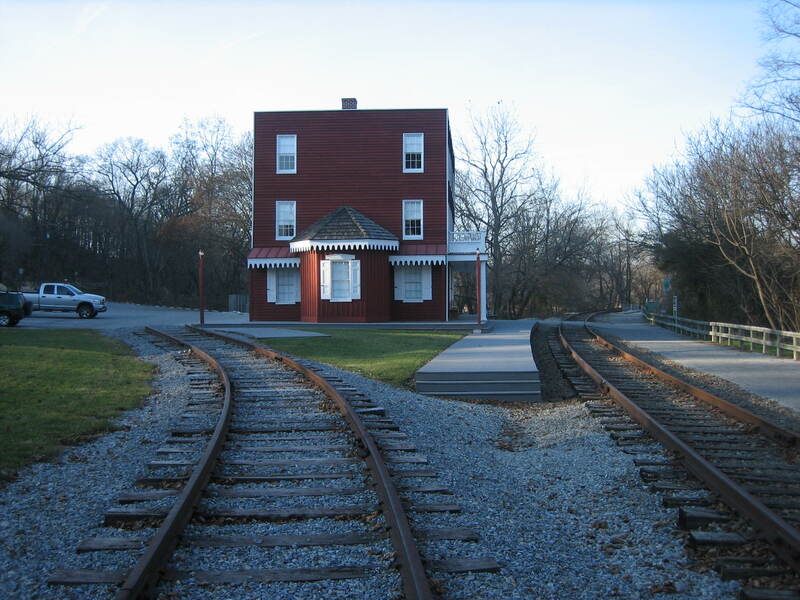 Hanover Junction, York County, Pennsylvania, near Seven Valleys, Pennsylvania, is located at the intersection of the Northern Central Railroad on the right of the reconstructed railroad depot, and the Hanover Branch Railroad on the left. This view was taken facing northwest at approximately 3:15 PM on Wednesday, December 3, 2008. In 1838 the Baltimore and Susquehanna Railroad constructed a line from Baltimore, Maryland north to York Pennsylvania. 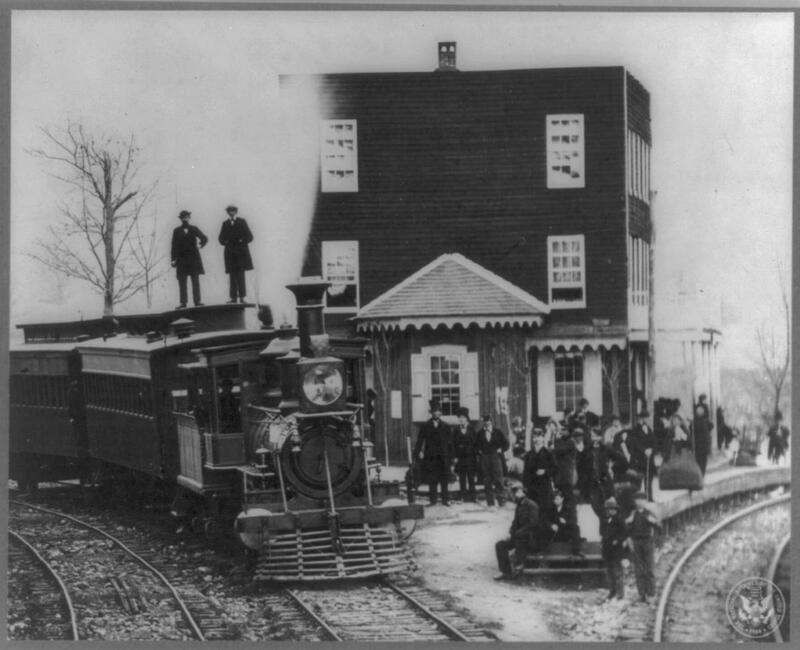 In 1851 the Hanover Branch Railroad began construction of a line westward to Hanover from the Baltimore and Susquehanna main line. 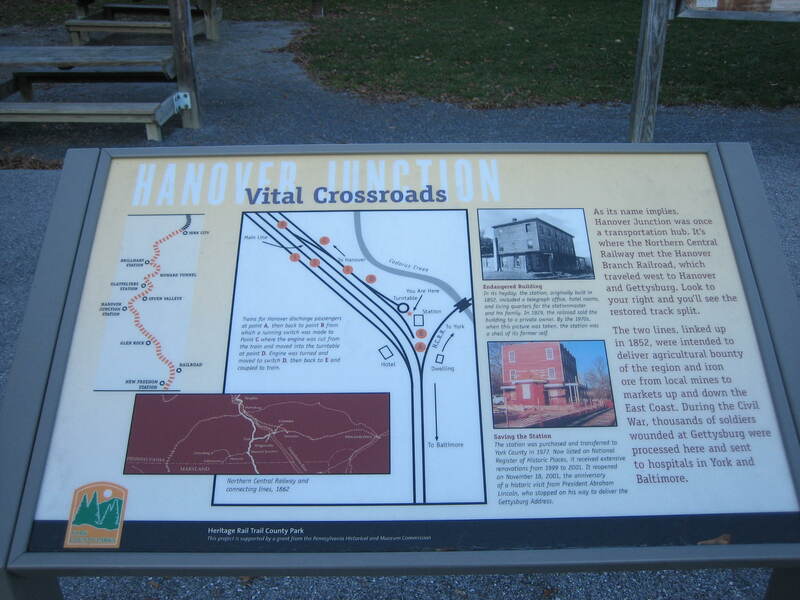 It opened in 1852, and the point where it connected with the Baltimore and Susquehanna was named Hanover Junction. 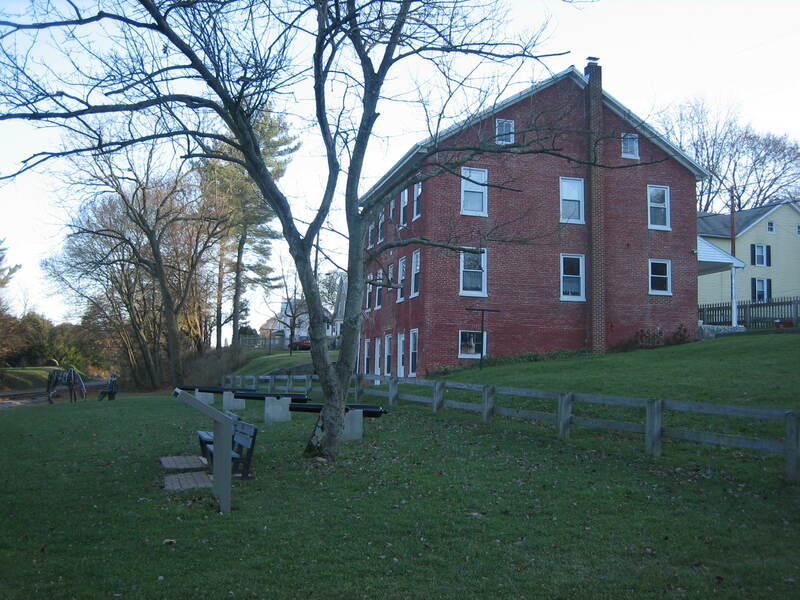 It is located approximately 46 miles north of Baltimore and 11 miles south of York. It is 13 miles from Hanover, and 29 miles from Gettysburg. 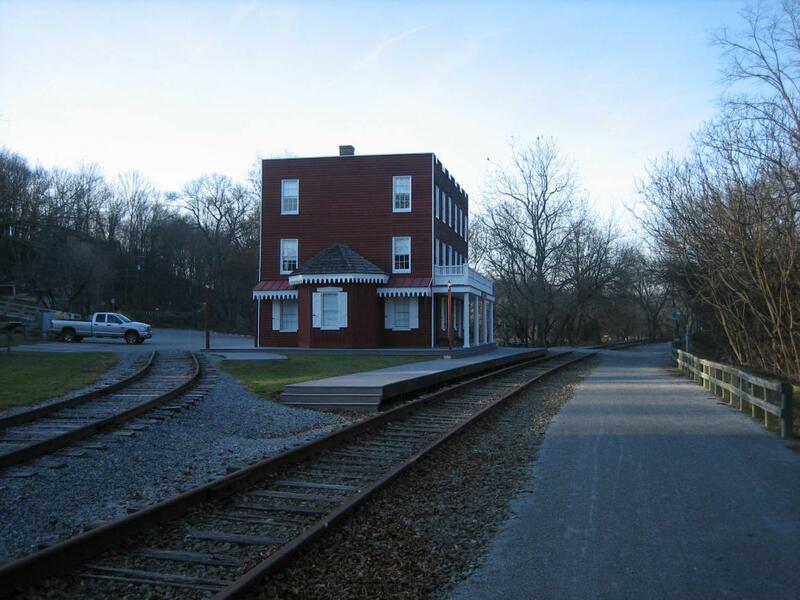 The Hanover Branch Railroad was originally operated by the Baltimore and Susquehanna Railroad, but the Hanover Branch Railroad began running its own trains in 1855, when the Baltimore and Susquehanna was reorganized to become the Northern Central Railroad. 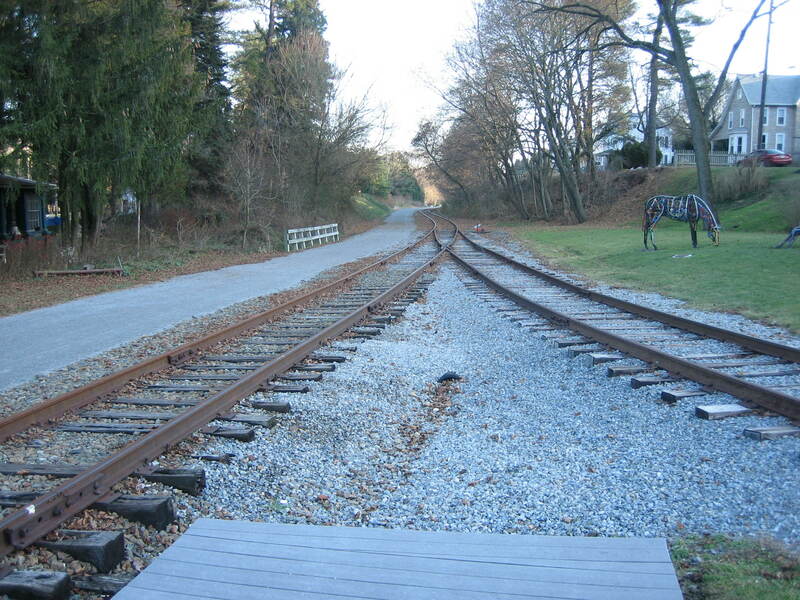 The Gettysburg Railroad constructed a line from Gettysburg to Hanover that was completed in 1858. 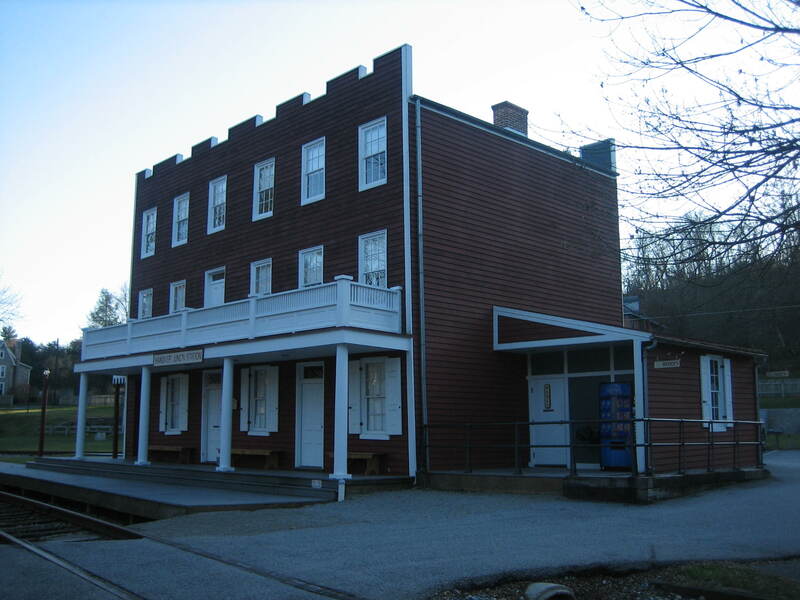 During the Civil War, Hanover Junction was strategically important. Besides being a railroad junction, it was a major telegraph dispatch station during the war. Confederate Cavalry, the 35th Battalion Virginia Cavalry or “White’s Comanches,” occupied Hanover Junction on June 27, 1863, and destroyed some railroad property at Hanover Junction before moving north to York. Fortunately the railroad station and the Hotel survived the raid. 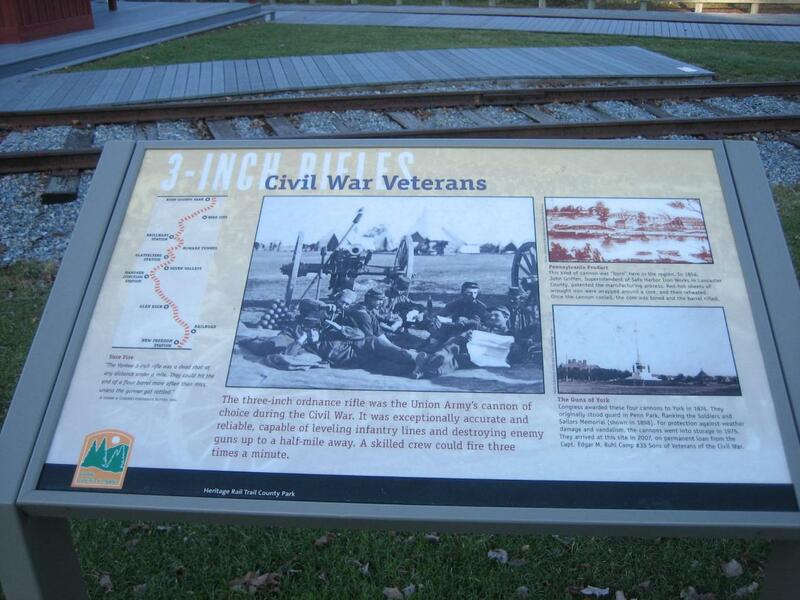 Wounded from the Battle of Gettysburg traveled through Hanover Junction on the way to hospitals in larger cities. On November 18, 1863, President Abraham Lincoln briefly got out at Hanover Junction on the way to Gettysburg to dedicate the Soldiers National Cemetery. 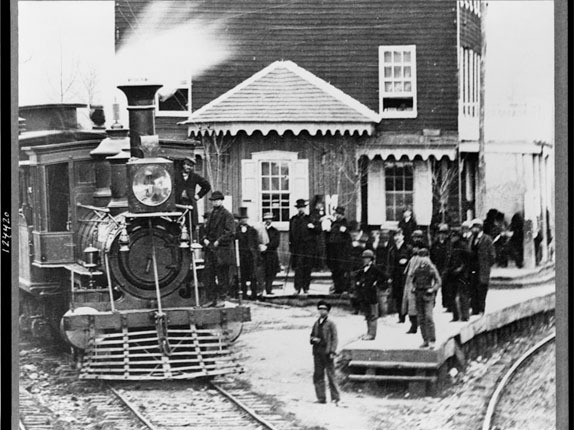 He also came through Hanover Junction on the way back to Washington on November 19, 1863. Lincoln’s funeral train, on its way from Baltimore to Harrisburg, passed through Hanover Junction on April 21, 1865 at 5:55 PM. 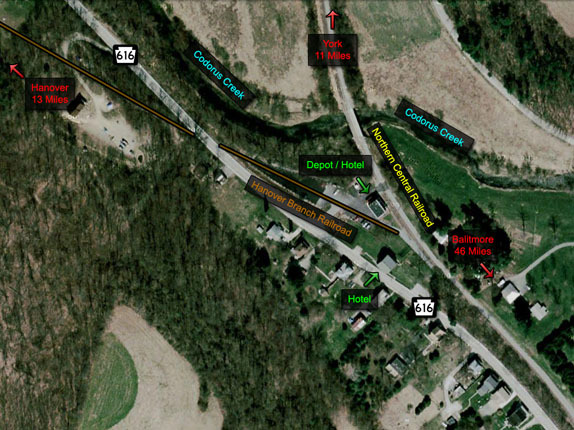 This map shows the Hanover Junction area today. Pennsylvania Route 616 is the road at the bottom of the image. 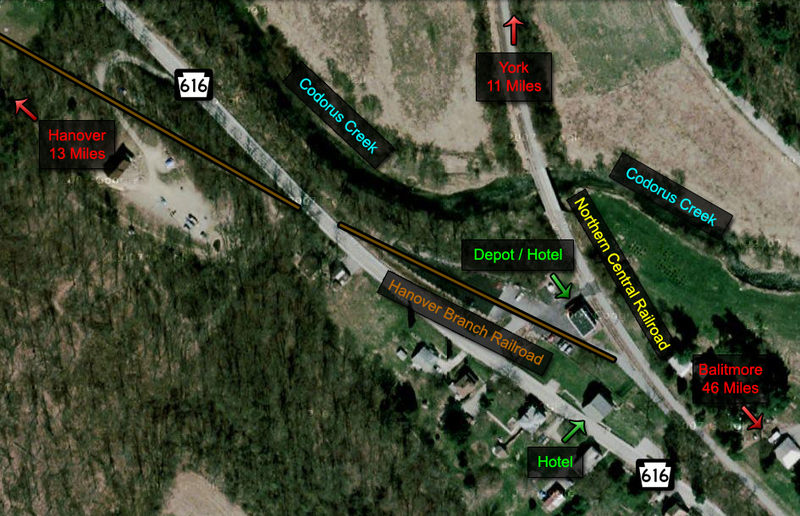 The Northern Central Railroad ran north of the railroad depot, over Codorus Creek, and the Hanover Branch Railroad ran south of the depot. This map was created at approximately 6:30 PM on Wednesday, December 3, 2008. 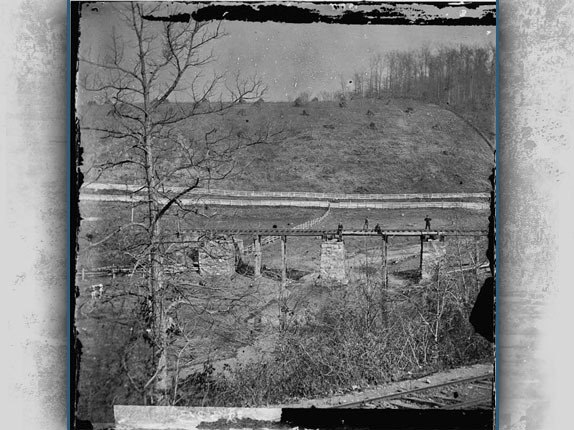 Hanover Junction on November 18, 1863. The main hotel is on the left, and the hotel/depot is on the right. 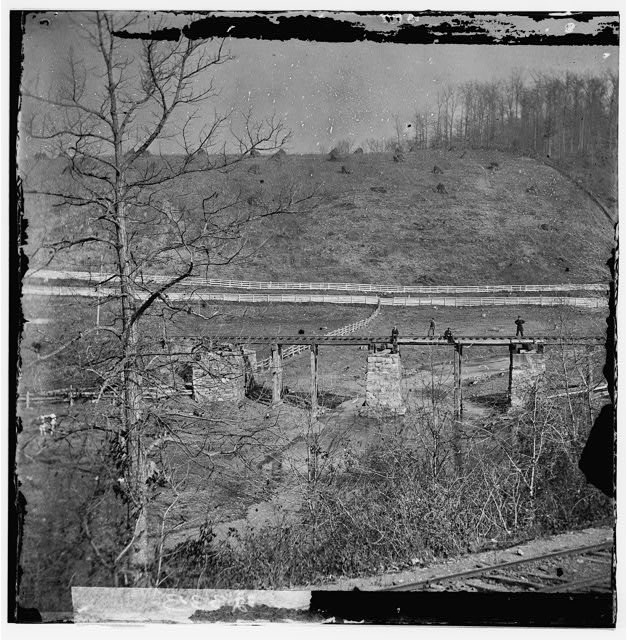 This view was taken facing northwest at approximately 4:00 PM on Wednesday, November 18, 1863. A similar view today. The 1863 hotel on the left is now a private residence. 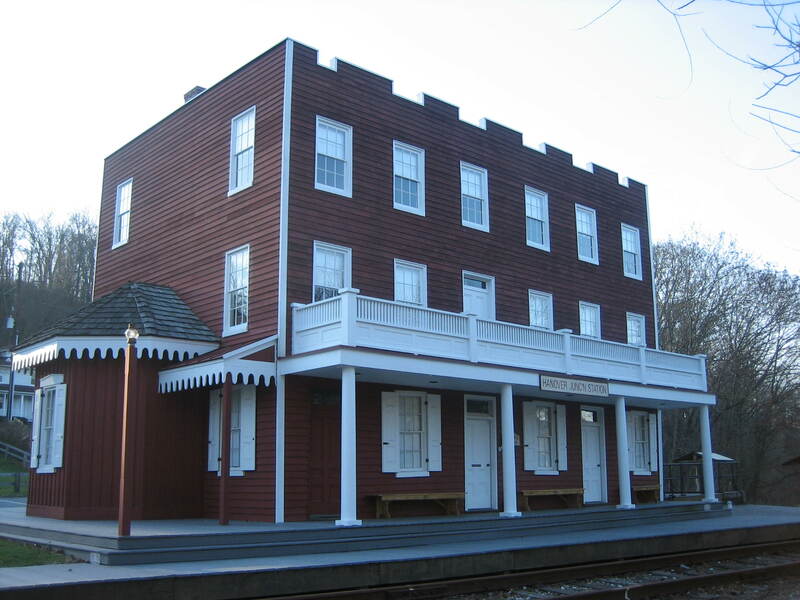 The hotel/depot on the right was refurbished and rededicated on November 18, 2001. This view was taken facing northwest at approximately 3:15 PM on Wednesday, December 3, 2008. 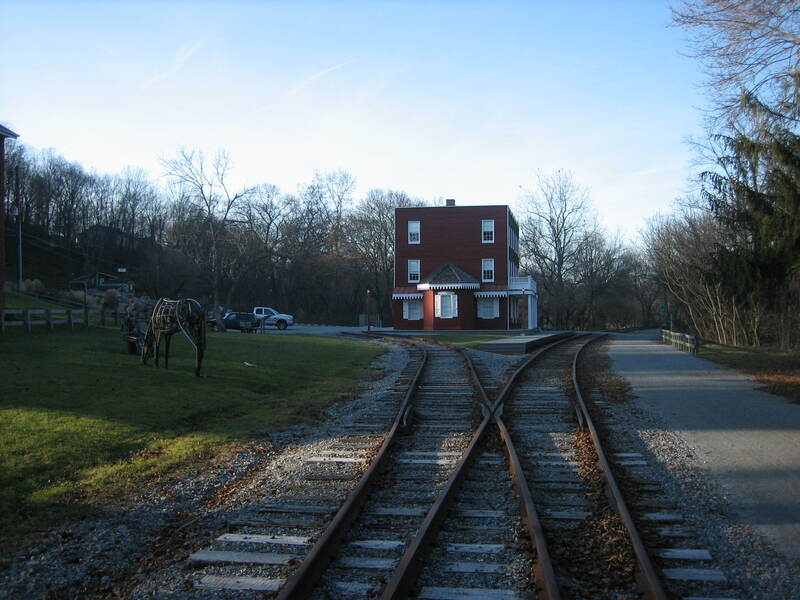 When Lincoln was moving on the North Central line north from Baltimore, he was scheduled to meet Pennsylvania Governor Andrew Curtin at Hanover Junction. Curtin was traveling south from Harrisburg. Curtin’s train was late, and Lincoln got out to stretch his legs. Three photographs were supposedly taken of the President on the platform in his top hat. Other scholars believe this person is not Lincoln, but Ward Lamon on November 17, 1863 when he was also delayed at Hanover Junction. The first picture is the first black and white photograph we have already showed you. 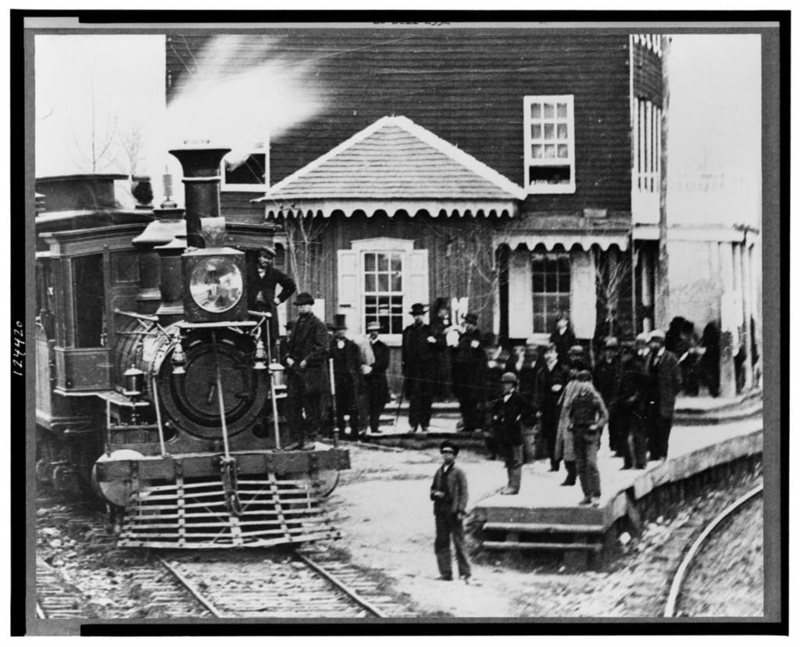 Lincoln/Lamon is standing to the right of (northeast of) the locomotive. The picture shown here has Lincoln/Lamon partially hidden to the right of the locomotive. This view was taken facing northwest at approximately 4:00 PM on Wednesday, November 18, 1863. The third picture has Lincoln/Lamon standing to the right of the locomotive, and underneath the left window of the train station. Lincoln finally tired of waiting for Curtin, and went on to Gettysburg without Pennsylvania’s Governor. This view was taken facing northwest at approximately 4:00 PM on Wednesday, November 18, 1863. The photographer in 1863 was obviously on a higher structure (railroad car?) than our picture today. This view was taken facing northeast at approximately 3:15 PM on Wednesday, December 3, 2008. 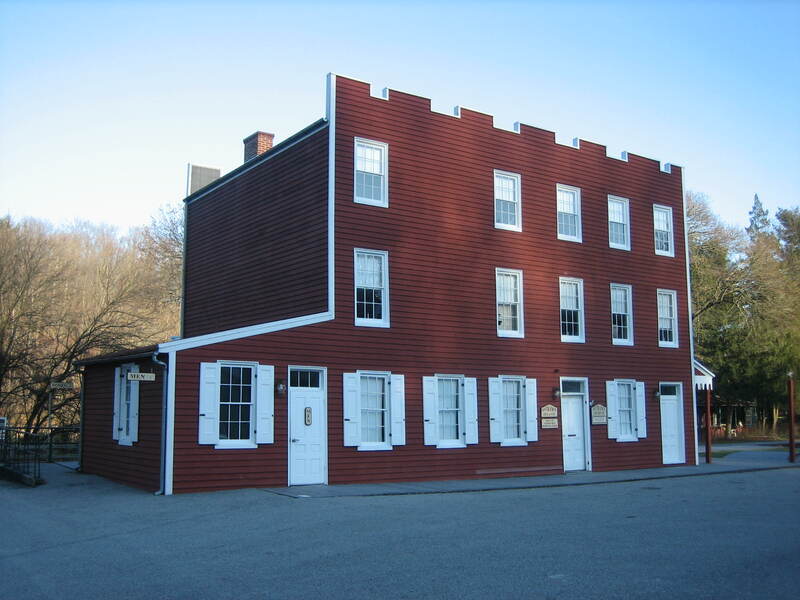 The Hotel/Depot or Station, originally built in 1852, housed a telegraph office, hotel rooms, and living quarters for the station master and his family. This view was taken facing northwest at approximately 3:15 PM on Wednesday, December 3, 2008. 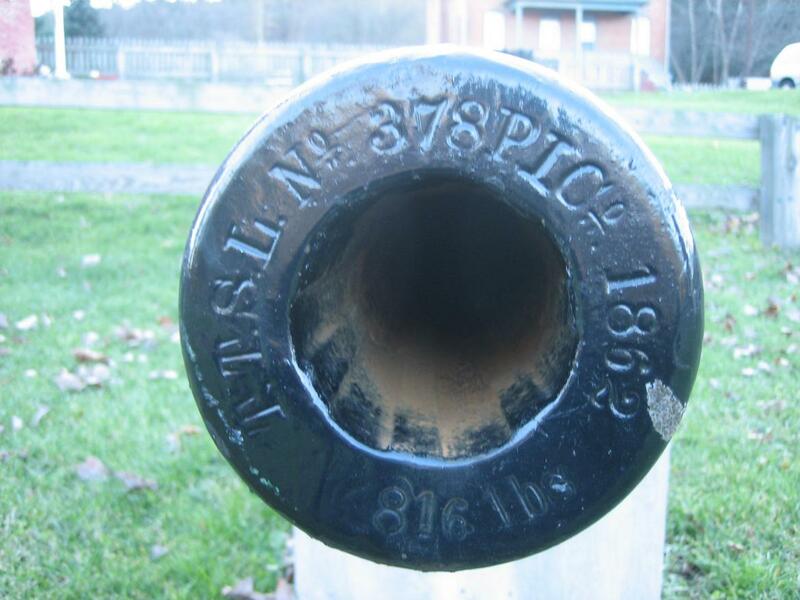 When the 35th Virginia Cavalry Battalion (White’s Comanches) cut the telegraph lines on June 27, 1863, they inflicted considerable damage to the telegraph office system. The Confederates, however, missed a couple of important objects. The batteries which supplied power for the system, located under the porch floor, were untouched. The telegraph system was not out of service very long. One of the on-duty telegraph operators hid his telegraph key in his clothing, and as soon as the wires were restored, his key was back in service to relay more messages to Baltimore and Washington. This view was taken facing south at approximately 3:15 PM on Wednesday, December 3, 2008. After the Battle of Gettysburg in July, 1863, the Hanover Branch Railroad provided a route for transportation of wounded soldiers to distant hospitals and cities via Hanover Junction. 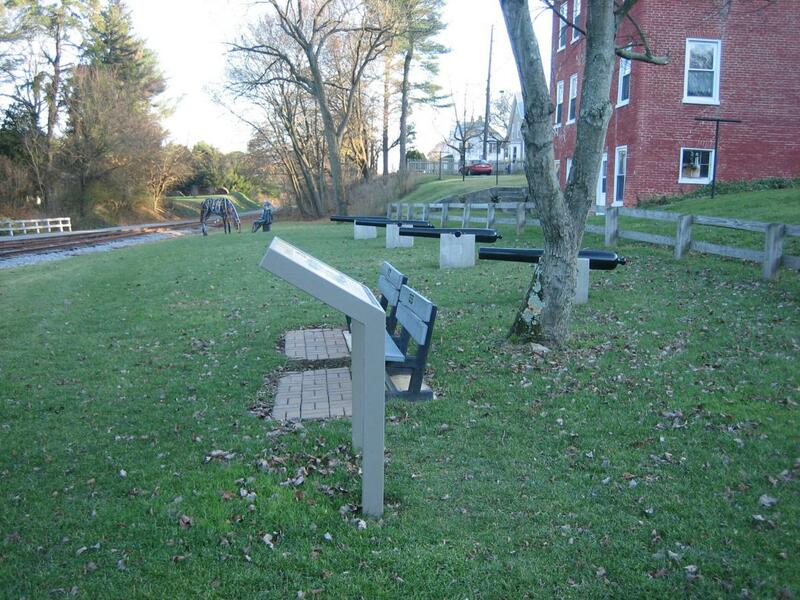 This was the only rail outlet available from Gettysburg to the outside world during the Civil War era. This view was taken facing southeast at approximately 3:15 PM on Wednesday, December 3, 2008. Today the Depot houses apartments and a Museum. There are also wayside exhibits on the property, including the one northwest of the depot. This view was taken facing southeast at approximately 3:15 PM on Wednesday, December 3, 2008. Here is the wayside exhibit northeast of the depot. 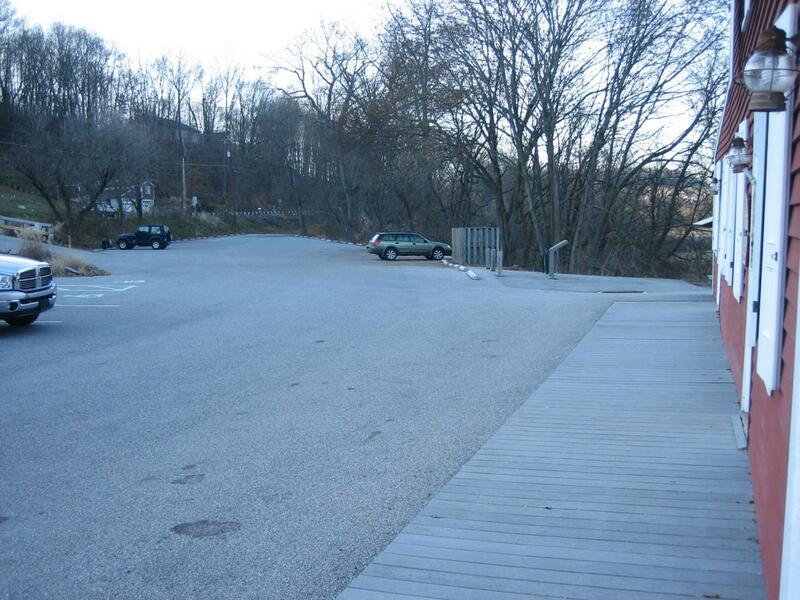 This view was taken facing northeast at approximately 3:15 PM on Wednesday, December 3, 2008. A map on the wayside explains how the trains entered the station and where the engines were turned around on the turntable located northeast of the Depot. 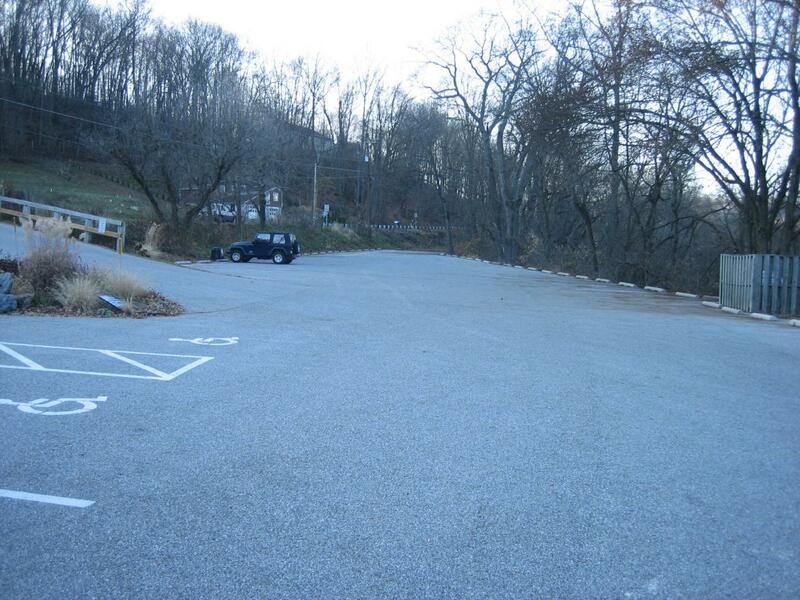 This view was taken facing northeast at approximately 3:15 PM on Wednesday, December 3, 2008. 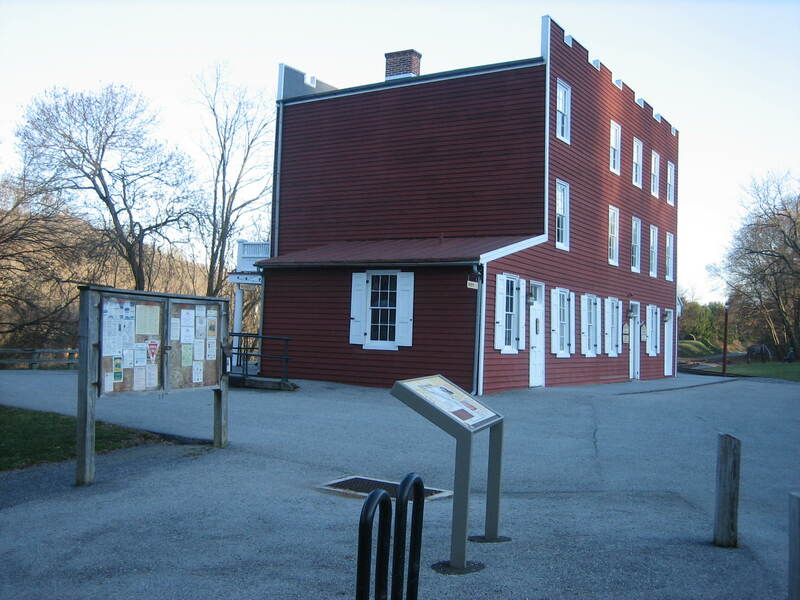 When White’s Comanches came to Hanover Junction on June 27, 1863, they set fire to the railroad turn-table, a repair building, and a “building by the ash pit.” The turntable was located northwest of the depot in the area of the parking lot near the wayside exhibit. The Hanover Branch line also went through the parking lot away from the camera. This view was taken facing northwest at approximately 3:15 PM on Wednesday, December 3, 2008. In the 1860s, there were four railroad tracks in this area of the Hanover Branch railroad. Some were sidings, others were used to help turn the locomotives around. Again, the Hanover Branch line ran away from the camera towards Hanover, approximately 13 miles away. This view was taken facing northwest at approximately 3:15 PM on Wednesday, December 3, 2008. We are now at the end of the parking lot. 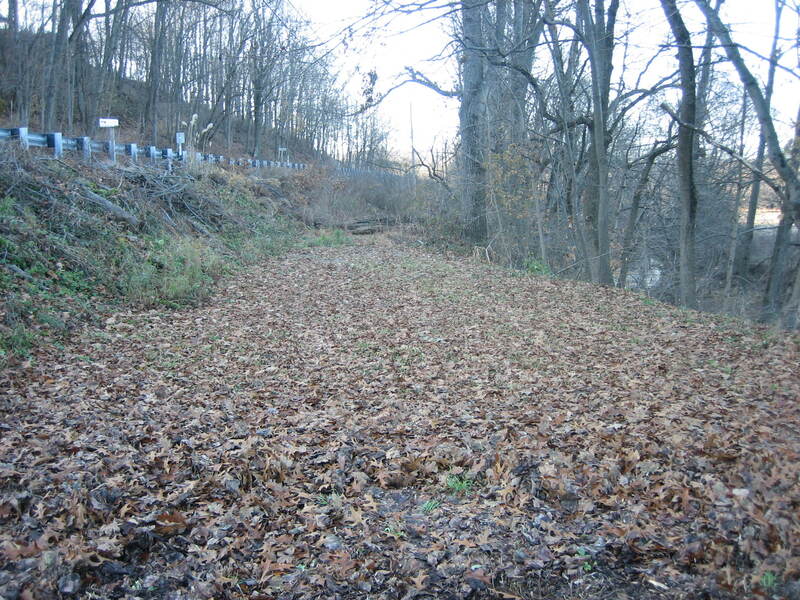 The Hanover Branch would have continued through the open area ahead of the camera. 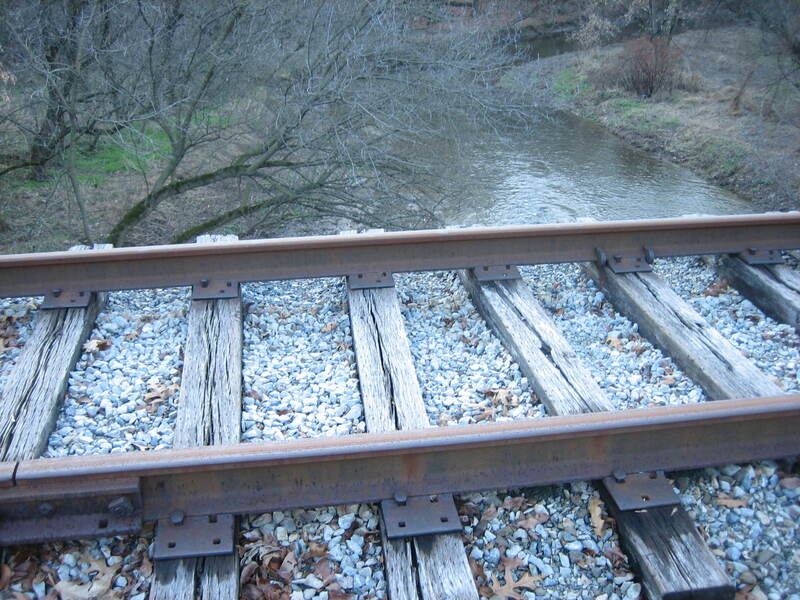 The Hanover Branch rails were removed from 1928-1934. This view was taken facing northwest at approximately 3:15 PM on Wednesday, December 3, 2008. 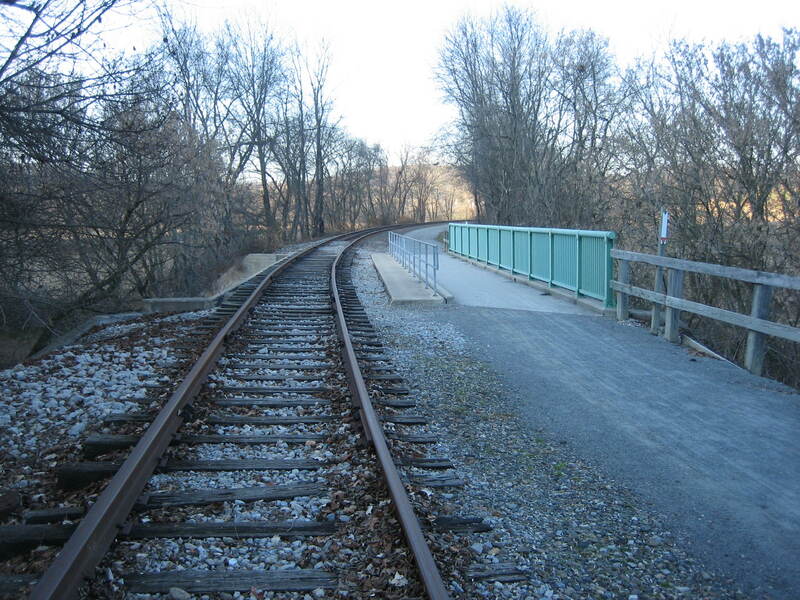 White Comanches also burned the Northern Central Railroad bridge across Codorus Creek on June 27, 1863. This action brought General Herman Haupt, a former Gettysburg native and Chief Engineer of the United States Military Railroad, onto the scene very quickly (he replaced the bridge). The military bridge was later replaced with a double-arch stone bridge. The stone bridge served until 1972 when it was destroyed by the flood waters caused by Hurricane Agnes. 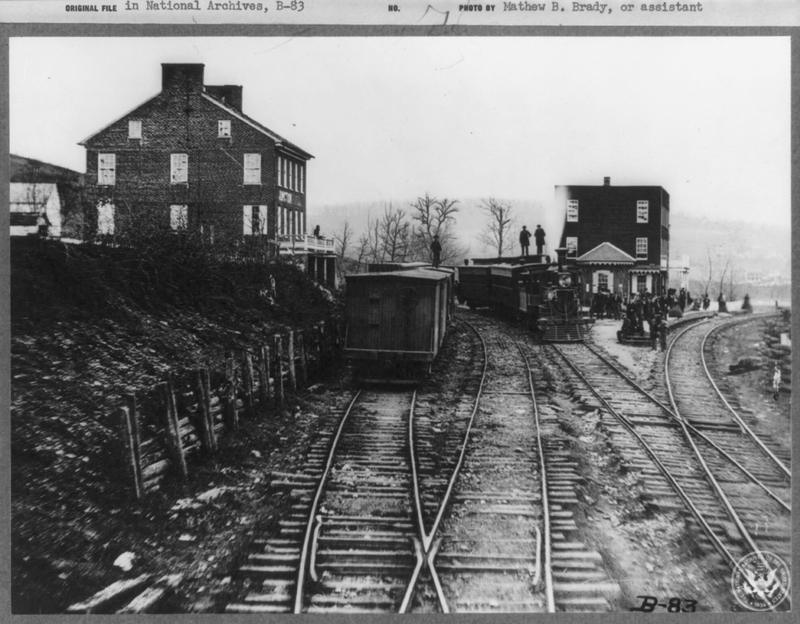 This view was taken from the Hanover Branch line facing east in the 1860s. Here is the Northern Central Railroad Bridge today. This view was taken facing northwest at approximately 3:15 PM on Wednesday, December 3, 2008. Here’s a view from the bridge looking across Codorus Creek toward the area where the Hanover Branch Railroad used to be located. This view was taken facing west at approximately 3:15 PM on Wednesday, December 3, 2008. 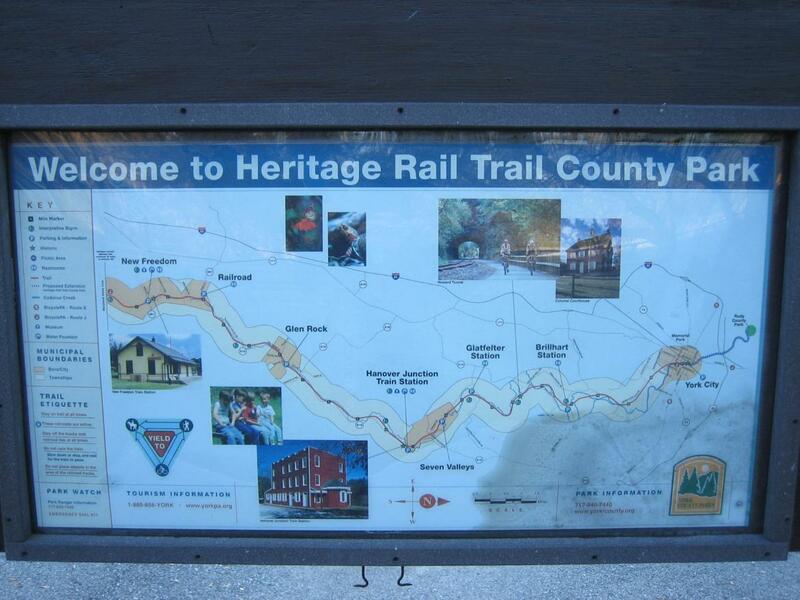 One of the most popular activities at Hanover Junction is to bike and ride the “Rail Trail,” which stretches approximately 40 miles from York, and south into Maryland. This view was taken facing southeast at approximately 3:15 PM on Wednesday, December 3, 2008. 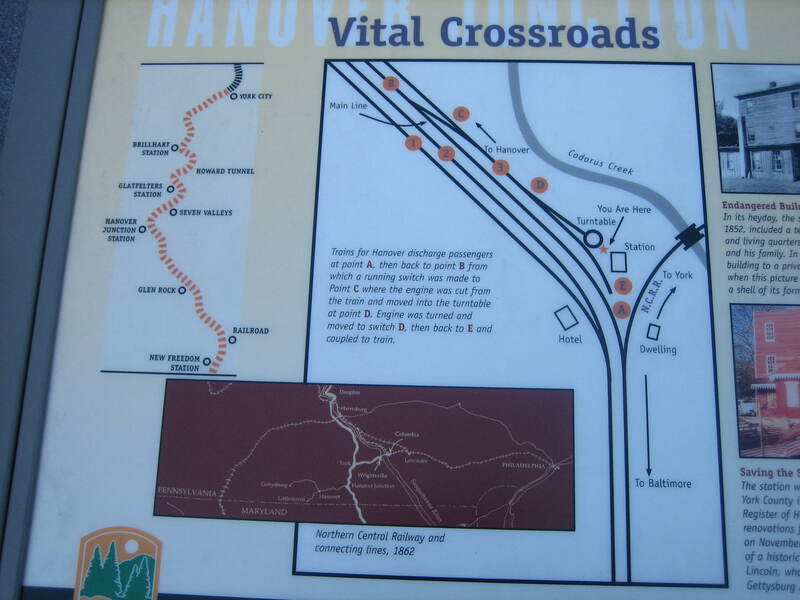 The trail is the lane to the right of the Northern Central Railroad tracks. This view was taken facing northwest at approximately 3:15 PM on Wednesday, December 3, 2008. 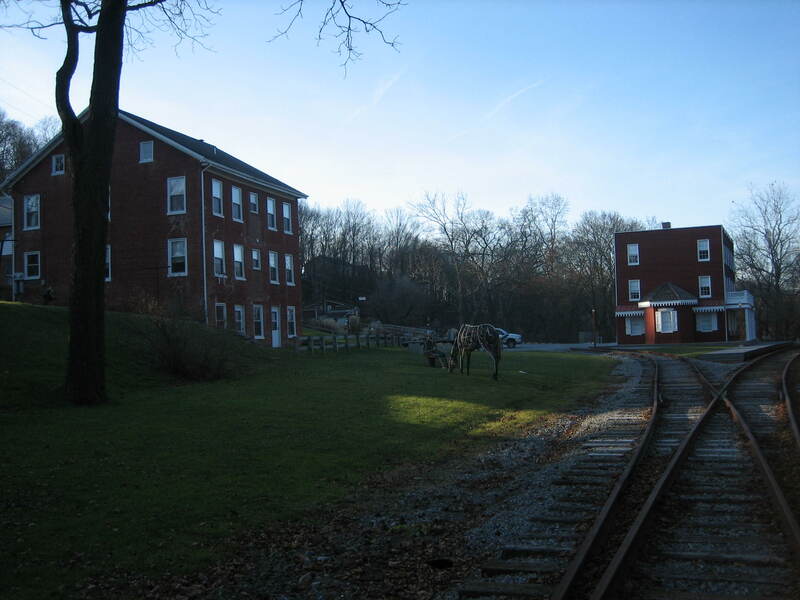 The trail is to the left of the railroad tracks as we look from the Depot towards the junction of the rails. This view was taken facing southeast at approximately 3:15 PM on Wednesday, December 3, 2008. 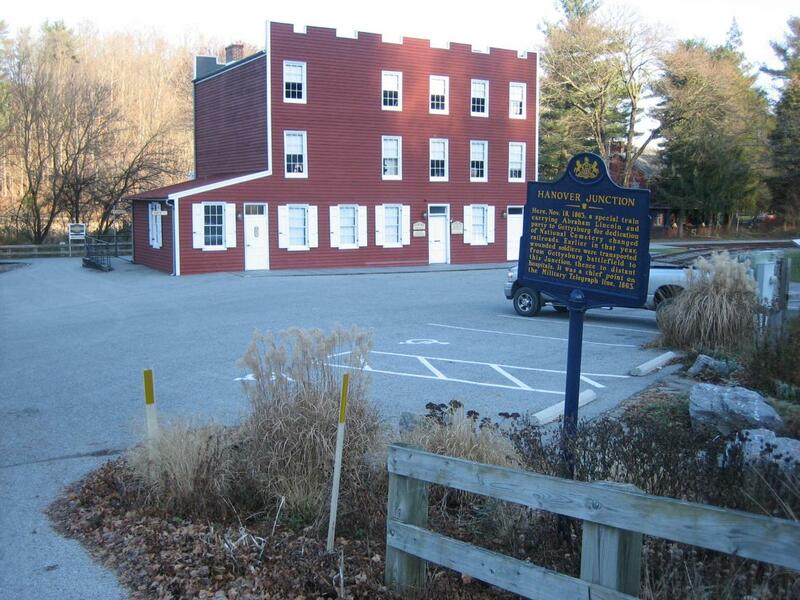 The museum was closed when we visited today, but there is a Pennsylvania Historic Marker near Pennsylvania Route 616. This view was taken facing east at approximately 3:15 PM on Wednesday, December 3, 2008. 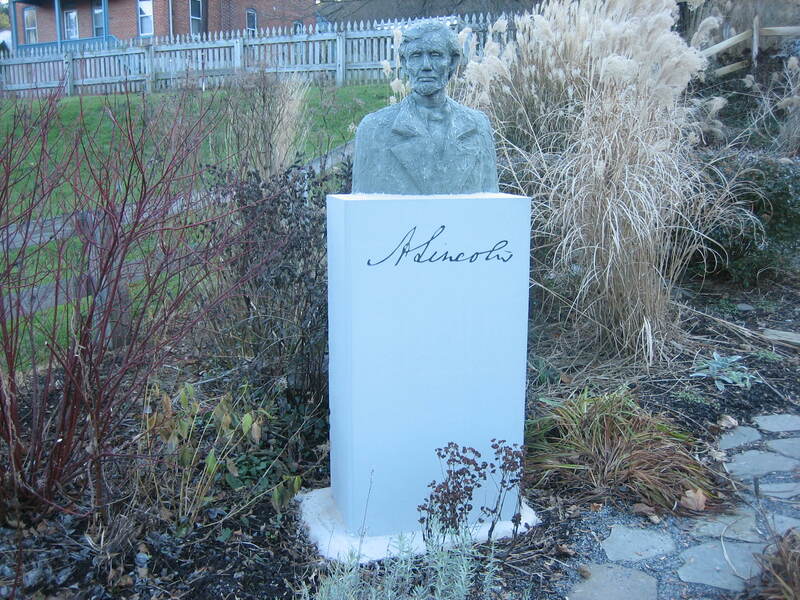 The marker is located near a small garden area, and a bust of Abraham Lincoln. This view was taken facing northwest at approximately 3:15 PM on Wednesday, December 3, 2008. So now there is a bust of Lincoln here at the train station at Hanover Junction, and a bust of Lincoln at the train station in Gettysburg. This view was taken facing south at approximately 3:15 PM on Wednesday, December 3, 2008. As we walked toward the old hotel, which is now a residence, we saw some other Civil War artifacts. This view was taken facing south at approximately 3:15 PM on Wednesday, December 3, 2008. Four Three Inch Ordnance Rifles. This view was taken facing southeast at approximately 3:15 PM on Wednesday, December 3, 2008. The wayside exhibit near them explains a little of their history. This view was taken facing northeast at approximately 3:15 PM on Wednesday, December 3, 2008. 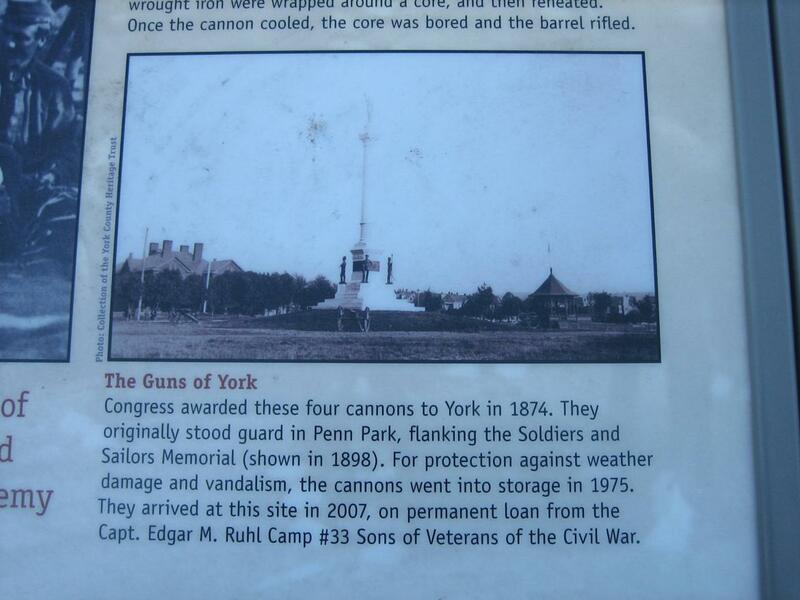 The guns were moved from York last year, after being in storage since 1975 to protect them from “weather damage and vandalism.” This view was taken facing northeast at approximately 3:15 PM on Wednesday, December 3, 2008. 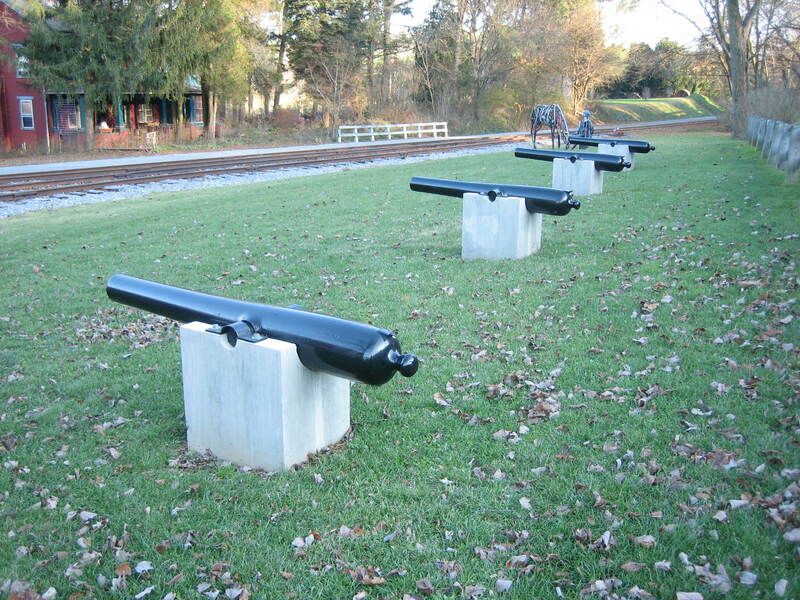 The cannon are mounted on cement blocks. 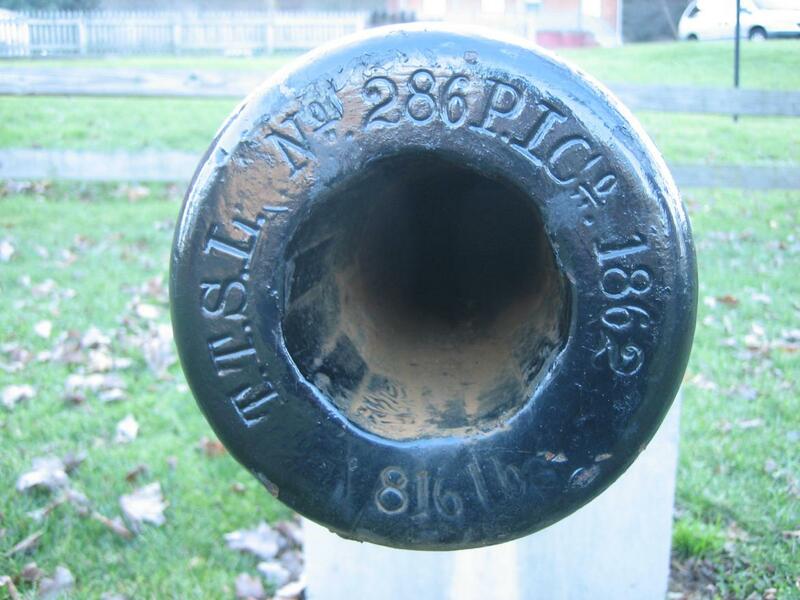 And to please the cannon fans out there, we decided to walk down the line and take pictures of the muzzle of each gun. We will start with the gun closest to us in this picture. This view was taken facing southeast at approximately 3:15 PM on Wednesday, December 3, 2008. No. 286. 1862. 816 lbs. This view was taken facing southwest at approximately 3:15 PM on Wednesday, December 3, 2008. No. 378. 1862. 816 lbs. This view was taken facing southwest at approximately 3:15 PM on Wednesday, December 3, 2008. No. 324. 1862. 816 lbs. This view was taken facing southwest at approximately 3:15 PM on Wednesday, December 3, 2008. No. 8 (or #3?). 1861. 809 lbs. This view was taken facing southwest at approximately 3:15 PM on Wednesday, December 3, 2008. See our post on Lincoln’s Visit to Gettysburg on November 18, 2008. 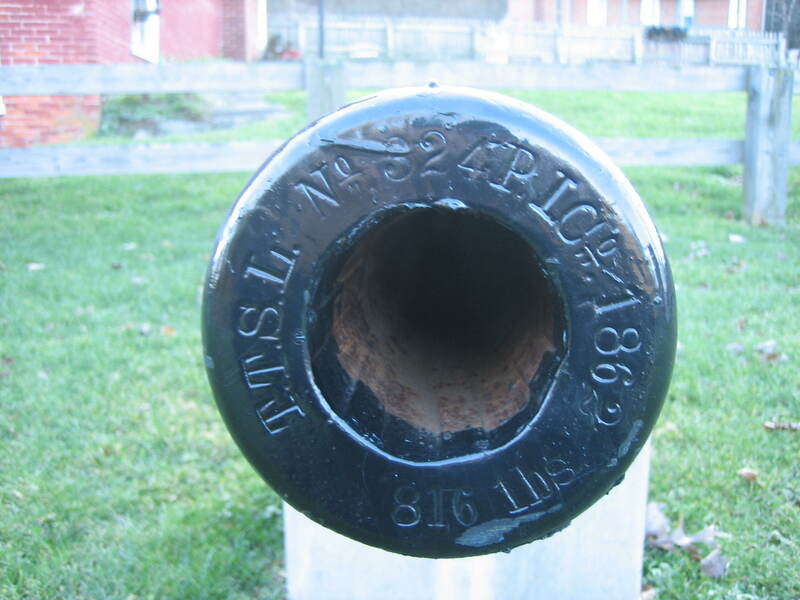 See our first post on the Gettysburg Railroad Station on March 6, 2008. The announcement that it would return to Gettysburg on August 23, 2008. 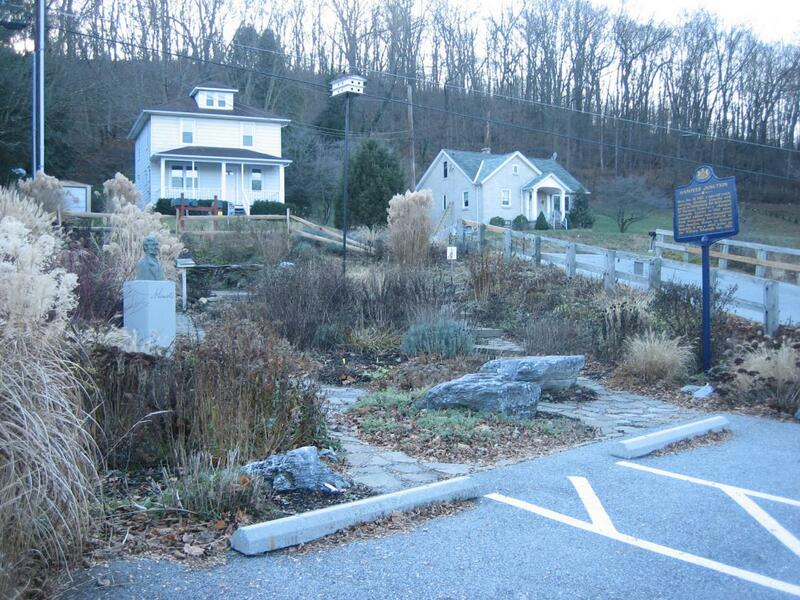 Photos of it on its return to Gettysburg on September 28, 2008. Confusing Gettysburg Address Memorial on May 16, 2008. Memorial Day Weekend at the National Cemetery on May 25, 2008. 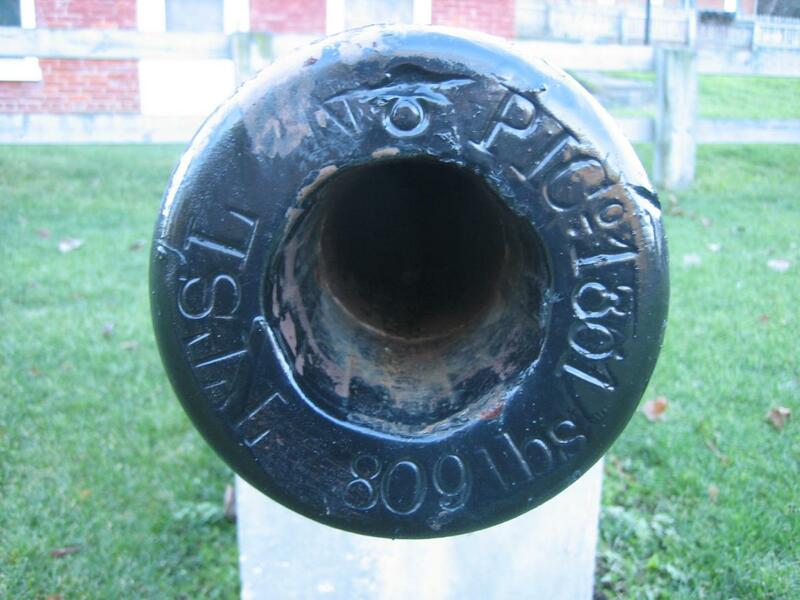 See our post on Civil War Artillery with Licensed Battlefield Guide George Newton on November 21, 2008.